Link opens in a new window? Embedding tours, videos, widgets, Paypal, etc. 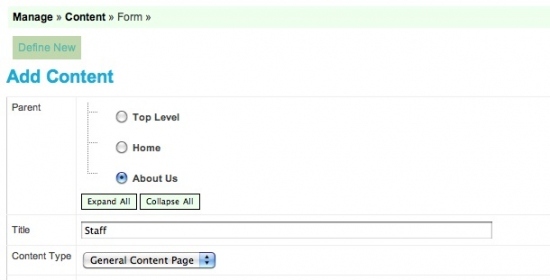 You have the ability to add an infinite number of pages to your site. That said, don't overdue it. Just always remember that site viewers should hopefully be able to find the page they are looking for within up to a couple steps from any page they land on within your site. If you bury a page so deep that they can't find it, that page becomes useless to them. If you have not planned the navigation of your site out in a logical format, review the Starting from scratch tab first, before you start adding pages. Clicking the 'Define New' button is the first step in creating a new page. Clicking the 'Define' button next to an existing page on the Content page gives you the same ability to edit the previously-defined properties for that page. Let's take a look at what you can do with these properties and how that impacts your site. We'll define a new General Content page under About Us by clicking the 'Define New' button at the top of the Content screen. Click the 'Parent menu' link on the right to learn more about what you see in the image above. This tutorial website is designed to assist our bytePages™ customers in working with the byteEditor Content Management System they have on their sites. Go here if you would like to have a bytePages™ template site, with this Content Management System installed in it: bytePages. SEO Title, Meta Description, Etc.